Barefoot massage vs Hands-on : why is it worth trying? Are you looking for deep tissue massage that is actually comfortable? You're in the right place! The surface of the foot is a lot rounder and broader than pointy thumbs & elbows, so it's much more comfortable. Gravity allows me to almost quadruple my pressure from using my thumb, and it's more than double what I can get with that wretched elbow. The broad surface of the foot engulfs large muscle groups, which makes tension in muscles such as the quads, hamstrings, hips and back dissipate much more quickly. As a result, I use my hands only if you're pregnant, incorporate cupping into a session, use bamboo tools or work on your face. Wondering if it's scary? Check out the testimonials from my clients. And you can schedule here. even on the really big guys! We give massage therapists the tools to become fanatical ashiatsu practitioners, curious anatomy nerds, and confident barefoot massage specialists within niche markets of sports massage, medical massage, and pain-science based relaxation massage therapy. 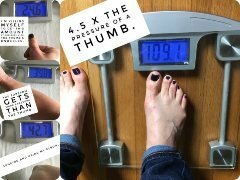 Massage therapists-want to learn to quadruple your pressure? Check out the video I made to show you the difference between thumb, forearm and foot pressure. I've been teaching barefoot massage since 2004, because I know firsthand the pain that develops when you do deep tissue hands-on massage. After a couple of years of working in a day spa, I had developed tendonitis in my right elbow and pain in my left pisiform with every massage. Learning barefoot massage saved my career. In fact, shortly after I discoved ashiatsu, I became pregnant and gave up hands-on massage. Barefoot massage enabled me to continue working while I was pregnant with twins (with permission from my midwives)! Read more about me <here>. Work intuitively with your feet! 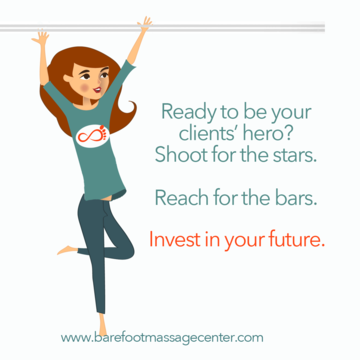 It's my goal as co-founder of Center for Barefoot Massage to make sure I teach you everything I can in your classes to make sure that you're not one of the statistics when it comes to short massage careers. I'm patient and am willing to answer any questions you may have in class. Our goal is to make sure NOT that you've memorized a routine, but that you know how to intuitively work with your feet on your clients. Please bear with me as I fix my broken links. Check out some of my class reviews here. how to transition your clients to barefoot massage. am I too big to learn ashiatsu barefoot massage? are my feet soft enough for ashiatsu? You have questions-I have answers! Let me know what you need! Am I too big for barefoot massage? How can I transition my clients to barefoot massage? Are my feet ok for barefoot massage? Is it reflexology? What IS barefoot massage? I massage with my FEET. Don't worry, they're pretty awesome. It's great for people who need consistent deep tissue massage on their backs, legs, arms, pecs, neck. This is me working at the World Massage Festival in Berea, KY. about 100 years ago. Funny story: once I had a student in class who said she'd seen this massage at the World Massage Festival. "Yes, that was me," I replied. "No, it was at the WORLD Massage Festival," she emphatically responded. "Right. That was me. I was the one working." "No, she was really good! They video recorded her!" "Do you mean the video where the therapist wears leggings with feet on them and works on a lady with Sponge Bob shorts? That was me." "Oh. Are you sure? She was really good!" Imagine how good it FEELS. I don't just teach barefoot massage. I live and breathe it, and you can too. "I have transitioned almost all of my clients to barefoot massage. Thank you!" 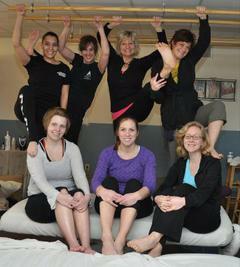 The Center for Barefoot Massage is super stoked about our membership site created for our students. Therapists get invited to the site as soon as they register for any of our barefoot massage classes. From the get-go, you'll meet the founders with videos on how to prepare for class, what to bring, etc. Inside the site you'll find videos for all levels of classes, downloadable forms, memes and so much more. Co-founders, Jeni, Paul, and I have spent 100s of hours on this site so that we make sure that once you learn barefoot massage in our class, you continue with your education and retention for years to come. And REGISTER FOR CLASS HERE. Palpate, discover, and work trigger points with your feet! In our FUNdamentals, class, we'll teach you how to use your feet like you do your hands, to palpate, discover, and work trigger points. You'll work lighter to deeper using a variety of styles of barefoot movements. For maximum performance, you'll learn the techniques on fellow students, have a series of clients come in for you to work on, and you'll receive feedback from the instructor by working on her. Special attention to techniques applied on the posterior and anterior aspects of your client's body will allow you to use gravity to effortlessly maintain consistent pressure. Comprehensive "feet-on" practice time will allow you to explore strokes on a number of different bodies in class--the other students, instructors, and several Class Clients that we'll bring in for you to work on. This work has been developed with a combined 29 years of barefoot massage experience on our own clients. We'll show you how to install bars above your massage table for balance, how to incorporate this new style of deep tissue work into your own client base and offer a variety of tips and tricks. 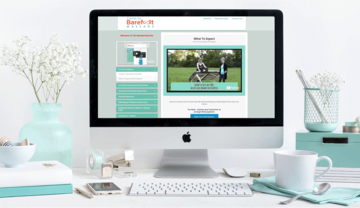 All therapists in class receive complimentary membership to our Graduate Membership Site at ❀ The Center for Barefoot Massage, where you'll discover tips, tricks of improving performance, videos of strokes and more. Register for Beginner's Ashiatsu Training here. It's time to get more intricate: access more muscles in both supine and side-body positions! In our Intermediate class, you'll have 2 days to work on each other and in a student clinic. Pre requisite: Fundamentals or equivalent. You'll learn how to do exquisite supine neck work as well as work larger muscle groups like the quads. We'll even delve into the adductors (so much less invasive than with your hands!) and the psoas. Register to learn more ashiatsu barefoot massage here. In our 2 day Advanced barefoot massage course, you'll learn to use your entire body weight to really dig in deep into the meaning of "deep tissue barefoot massage". This class requires therapists to have upper body strength and co-ordination. You'll learn not only how to use both feet and your full body weight on clients who are at least 50 lbs heavier than yourself, but we'll show you more intricate body positionings and detailed work. When you learn advanced barefoot FasciAshi, you'll really take your skills into a more therapeutic and deeper-than-deep massage. Register for Ashiatsu training here. Creating MOVEMENT is the concept behind stretch therapy. Increasing our Range of Motion (ROM) becomes more important the older we get, or our joints lose flexibility, making us more prone to injury. In this class, you'll discover how to stretch their clients as well as increase ROM by using stretches and Passive Resistance. We throw in a little Pin and Stretch for fun too, so you'll learn a variety of ways to increase your client's flexibilty, thereby improving their performance. You'll learn a full body stretching with Thai type movements. We'll show you how to drape during class, just like you will in your private deep tissue massage sessions, and you can easily add a new service to your menu. Register for Ashiatsu training class here. it has certainly helped in making my practice so successful! Thank you so much! Where can I learn Ashi? Deep tissue barefoot massage classes should really be live, in a classroom setting. Those who believe they can learn to use gravity to do deep tissue massage, chew on this: your liability insurance will likely NOT cover you if you've not taken an approved course. What happens if someone gets hurt during a session? The great thing about our barefoot massage CEU classes is that you hear the instructor talk about the strokes over and over again. You feel each stroke from her. You WORK on her during class, receiving valuable feedback about your strokes: Are they safe? Are they smooth? Are they comfortable? Can they better? And to top it all off, we have seasoned male guest clients (not like steak seasoning, silly, like "well-trained") who will give you feedback about each one of your ashiatsu barefoot strokes. It's often the favorite part of barefoot massage class for the therapists. Register for our live barefoot massage training HERE. There's a difference between CE hours and certification. the action or process of providing someone or something with an official document attesting to a status or level of achievement. Online test. The answers are not the easy-peasy fill in the blanks and short answers you may see elsewhere. Our ashiatsu certification quiz requires you to use your noggin. The questions are things we talked about extensively in class, you've journaled about or have experienced in your practice. Performance video: To get certified in Ashiatsu, you must also submit /upload several videos of you performing your barefoot massage. They don't need to be anything fancy--we've got a video in our ashiatsu membership site telling you how to do it.Our instructors will evaluate you and determine if you need tweaking or are good to go. Client Evaluations: the last step in the ashiatsu certification is to upload your 20 client evaluations. Yes, it's a lot of work. Why do we make you go through that? Because it means something to have completed all that hard work. 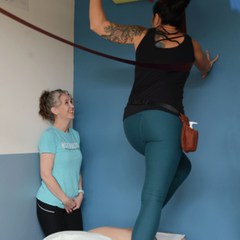 That fancy ashiatsu barefoot massage certification on your wall means that you worked your hiney off to get good, and you've got something to show for it. Where can I learn barefoot massage? If you want to learn amazing deep tissue barefoot massage, I teach barefoot massage and Bamboo-fusion at my training facility in Cincinnati and also train instructors nationwide in our barefoot massage class. Many students have been using AirBNB for inexpensive and interesting lodging. We also have Uber and Lyft. 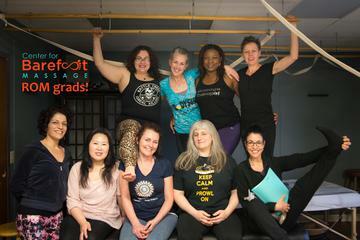 Register for all levels of Barefoot Massage Training HERE. Your clients will love it because Ashiatsu barefoot massage feels great, and it's a comfortable deep tissue massage (unlike using your thumbs and elbows. Ouch.) The foot is a perfect tool for the larger muscle groups such as the hips, hamstrings, quads and traps. By adding barefoot massage to your repertoire, you instantly increase the clientele you serve. Big guys, women and athletes who may have in the past look at you and think, "You could never give me enough pressure" will be amazed at what even the smallest of therapists can do for them utilizing this modality. Are you a bigger therapist? You can still learn this style of barefoot massage. It's all about grace and shifting your body weight. Check out our blog. 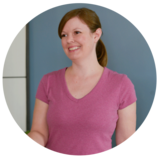 We share tips on barefoot massage, massage business, updates on the Center for Barefoot Massage membership site and more. You'll find video links for our Tuesday Toesday tips and updates to our YouTube channel. 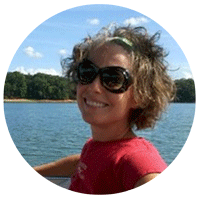 "I loved how Mary-Claire instructed on an individual level when we did something incorrectly. She truly wanted us to learn. Mary-Claire was very gracious and I loved her theatrics." Your existing clients will be amazed at the depth of compression you can give to the back, legs and hips. Your new clients will keep coming back for more. This is just the beginning of reduced therapist fatigue and increased profits! Click HERE for class info!